A cold day, a cold north wind, occasional heavy showers. Did I really wish to spend an afternoon in Winchester? Bus, train to Alton, then bus to Winchester. Dysfunctional public transport. Time of arrival of train at Alton is same time as the bus departs. As the train pulls in and comes to a stop, the doors open, I leap off the train, run out of the station, leap on the bus and catch it as it is about to pull out. As the bus pulls away, I observe people leaving the station who have just alighted from the train. The sun is shining as I reach Winchester, and it is warmer than when I set out. I am feeling rough from the bus journey and go for a walk. Lunch at The Bridge Patisserie, which was something of a disappointment. I can see why they are getting bad reviews on TripAdvisor. Calamity strikes. I do something wrong on my camera, over a thousand pictures deleted, gone in a blinking of an eye. I walk along the river. Now cold, no sun. I look in the bookshop in the back streets behind Winchester Cathedral. A real bookshop. I ask when is Manuscript Found in Accra due out. Something Waterstone’s unable to answer. I assumed some time soon as been coming out all over Europe this week. But no, not until April 2013! 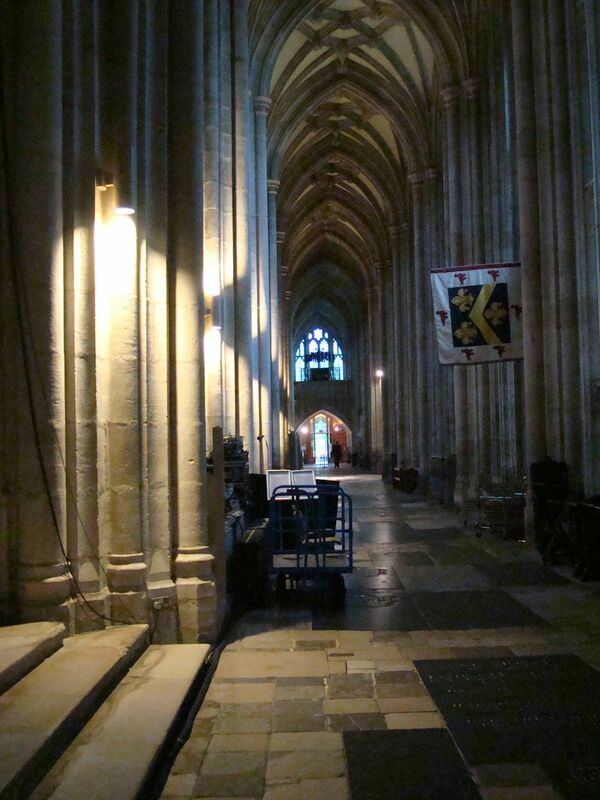 I wonder into Winchester Cathedral Not quite dusk, but soon will be. Dusk is the time to see a mediaeval cathedral at its best. I light candles for Canon Andrew White, Paulo Coelho, my lovely Russian friend Lena. Evensong is about to begin. The choir emerge and sing in the South Transept. It is a song of welcome. The acoustics are amazing. I sit at the foot of a shrine or tomb. I am the only one there. I follow the choir and sit in the choir stalls for Evensong. It is sung evensong or choral evensong cf spoken evensong. I had not intended to stay. I do, and as a consequence I miss two buses. Walking to the High Street I spot a little alley I had not noticed before that leads to a coffee shop. As I walk down the High Street, I spot a little alley I had not seen before that leads to a pub hidden in the alley. I catch the last bus. I once again experience dysfunctional public transport. Train departs Alton ten minutes early Bus arrives as train departs. Forty minutes wait. I go to Waitrose. At Aldershot, train arrives two minutes after bus departs. Almost 30 minute to wait for the next bus. I visit a local shop and chat to Nepalese girl serving in the shop. From leaving Winchester Cathedral, almost three hours until I reach home! one hundred and fifty three. A fire burned on the beach. and also this man waiting. The charcoal was white hot. But was the man there? the next he was not. Master, they said, don’t go. Now there was too much. I heard this read a few moments ago by Andrew Motion. Very moving. It was like hearing something from Khalil Gibran. Andrew Motion was on the last in the series of Honest Doubt, a series by Richard Holloway, former Bishop of Edinburgh, talking about religion. Also featured was Tears in the Rain from the film Blade Runner. Shame on the BBC that they are not holding this excellent series on-line. The omnibus edition on BBC Radio 4, 2100 BST tonight. Andrew Motion explained how he came to write the poem, sitting in church listening to the service. The relevant text is St John Chapter 21. Moments, a diary with illustrations by Catalina Estrada and quotes from Paulo Coelho. Each month opens with a beautiful illustration by Catalina Estrada and a quote from Paulo Coelho. Each page opens with a quote from Paulo Coelho. Diaries usually have less space for weekend entries. Moments turns this around and devotes an entire page to Sunday. If you were at a loss what to give someone for Christmas and you knew they needed a diary, I could not think of anything better than Moments. Moments seems to have become something of a collectors item, at least going by the prices on Amazon. My copy is a personally signed copy to me. Catalina Estrada designed Scarves for Solidarity. Monies raised go to support Laboratorio del Espíritu, a project in Colombia. Aleph is the story of loss of faith, of rediscovering that faith on a journey on the Trans-Siberian Railway. Aleph is now available in paperback in UK, in US in June. Lord, bless our week. May we have the strength of the mountain and the wisdom of the water. We do not receive wisdom, we discover it for ourselves, after a journey through the wilderness which no one else can make for us. There cannot be many parties that start with prayers. There cannot be many parties that start with prayers in Portuguese, then in many, many languages. Exactly one week ago today it was St Joseph’s Day. I was at a party in a Venetian medieval castle, guest of Paulo Coelho. It was exactly one year, one week, one day to the devastating tsunami that hit Japan. Very moving prayer from Yumi. She was in tears. I was holding hands with Mio. Mio was in tears. I was in tears. Even now, watching one week later, I am in tears. You are currently browsing the archives for the prayer and meditation category.